"As a teacher one shouldn't be at a loss for words but, looking back on my forty years of teaching at Stanford, two of my clearest memories were of not knowing what to say," Charles commented during our visit with the Dreks. "President Sterling sought out my wife and me at one of his garden parties and, with a gleam in his eye that I didn't know how to interpret, remarked that I was the only one of his son's professors who had given him less than an 'A.' Staring blankly at him for a moment or two, I finally produced, ‘Medieval philosophy may not be for everyone.’ C- for me on that one. "Then that day we all remember. The Dean of Students asked me and two others to speak to undergraduates assembled in Dinklespiel, about the meaning of President Kennedy's death and provide, if we could, some balm for their shaken spirits. Walking to the hall that drizzly, dreary late November afternoon, my own spirits not enlivened by the dirge from the carillon tower (the only time I've ever heard that drone), I tried to conjure up some relevant thoughts of the political thinkers who have been my livelihood. Just that remark about how little one man (i.e., person) can do to make the world a better place but how much destruction one men can do. (I left out the first half.) It didn't much matter that again I was at a loss for words because I pretty much fell apart and wouldn't have been able to say them. I hadn't done much for sinking spirits. "Now that you may have a vague sense of who I (CD) am and perhaps wishing for that 'loss for words,' I'll give this space back to Annette." Charles hails from Wisconsin and Margot from Boston. Halfway through his years at the University of Wisconsin Charles was inducted into the army; World War II had obligingly ended and he never was asked to do much damage, He returned to UW. Margot is a graduate of Oberlin where she was president of the student council and later on the alumni board. After getting an MA in history at Columbia, Charles taught at Boston University and spent a year in India writing a book on ancient Indian Political and social thought. Margot also had a Fulbright hers to Paris where she wrote a dissertation on eighteenth century abbes who were more in interested in the parties of salon hostesses than in ecclesiastical affairs. The two met as graduate students at Harvard and were married a month after Margot's return from France. At Stanford Charles sometimes felt he was in a situation comparable to the VW teaching political sociology, sociology of religion, bureaucracy, sociological theory, psychoanalysis and social structure, and social psychology. Some of these “courses”, he’d never had as a student. But during his second year he succeeded in insinuating himself into the political science department: half in half in the other. Now of course he had twice the drudgery of departmental committees. The Carnegie Endowment, with a grant for a year at Harvard Law School, allowed him time to develop a general course in the history of political theory and he was now back in familiar territory when the political scientists accepted him into their ranks. Margot continued in the Western Civilization program and taught seminars on Galileo, on Rousseau and his contemporaries, psychoanalysis and history. Charles retired from teaching in 1998 and Margot earlier when the children began to arrive: first Nadja, who is now a social worker in Chico; then Peter, an environmental activist (as he described himself in the voter's manual) and now a member of the Palo Alto City Council; finally, in 1968, Kai, a founder of Score! (a computer-assisted learning project) and now launching a program to help students at these two-year technical schools keep from failing. As of this writing there is one grandchild, Emily Olive. Because the Dreks are an endangered species (we're the last) subtle hints are dropped from time to time suggesting that Kai and his wife Sarah produce a brother for Emily and that Peter should not devote all of his time to the further greening of Palo Alto. The children have gone in several directions, but most are within a few hundred miles of the old homestead an Eichler house which exists comfortably among fifteen others in a cul de sac which Charles believes is the second-oldest in the city. There isn’t quite the same sense of community that existed in1962 when the Dreks bought the house (for a price that could make you sigh). “Most of the neighbors boarded a vessel belonging to the family across the street and we all sailed off to Alviso for an Italian dinner. For a number of years we paid the police department five or ten dollars to close off the street for our block parties.” Two of the families had ten children each and one of the matrons still lives here. But the Dreks are the second most senior inhabitants. It is a far more cosmopolitan neighborhood now Charles estimates that English is the second language for half the families. Although much has changed and the old neighbors are gone, the street still floods from time to time, the raccoons stil- threaten the cats, the eucalyptus trees keep people busy in their yards. 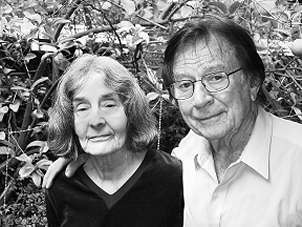 Looking back, Charles and Margot see the ‘60s as the high point of their academic life. Charles was invited to start a political science department at Rice in Houston (their political scientists were housed with the historians) and this seduction got him tenure at Stanford. That, Houston's weather, and the possibility that Lyndon Johnson would join the new department after he left Washington, encouraged Charles and Margot to stay in California. Within a year or two, as the Vietnam War was heating up, it became clear to them and a number of their colleagues that academics had the responsibility of analyzing the disaster unfolding in southeast Asia. Charles and Claud Buss of the History Dept chaired an all-day 'teach-in' utiltizing the various specialties of the Stanford faculty. Teach-ins blossomed all over the scholarly map but only Michigan was ahead of Stanford. At the behest of activist students, Charles and six other faculty from the social sciences arranged for thirty students fifteen black and fifteen white to join Martin Luther King in . 'Resurrection City,' a project planned for Washington DC. For there to be academic credits the students had to pursue a course of study that included everything from the techniques of participant observation to the history of the civil rights movement. Their commitment pushed them to work hard, and the two grad students who worked as teaching assistants said they'd never seen such devotion to studies. Alas, on the day before they were due to leave for Washington, Rev King was assassinated. The tents of Resurrection City never went up. Heavy times those. The two Drekmeiers, along with Bud McCord (Dean and Sociologist), started a new social science program in 1959 called Social Thought and Institutions. Really an honors seminar. It lasted for twenty-three years until 1983. One could major in Social Thought provided he or she wrote an acceptable honors thesis in the second year of the two-year program. There were never more than fifteen students and the instructors usually numbered four (over the years there were twenty Stanford faculty involved). One concept or idea would be examined during the year (perception, revolution, motivation, myth and symbol were some of them.) The group met once a week, usually at the Drekmeiers. Since it was the labor of love and no salaries were paid they were free of decanal interference. A true collegiate operation. The Drekmeiers viewed those Thursday evenings as a sort of refuge. And their children, listening from the hallway, say it was a learning experience for them, too. When, during that feverish year, 1968, the family was invited to participate in the Stanford Overseas program – specifically a quarter at the English campus and a quarter in Vienna – it seemed to be a good time to relax a little and get to know the children better. Stanford had leased a huge manor house from the Jesuits in the vicinity of Grantham (Newton country) in Lincolnshire and the Dreks settled in on New Years' Eve. Charles lectured on English political thought from the Magna Carta to Churchill holding forth from the pulpit in the chancel. He and Margot gave a seminar on English contributions to psychological theory. It was at Harlaxton Manor that Peter and Nadja saw snow for the first time. Students were not above taking advantage of this hyper 3½ year old, and Peter was used to initiate food fights and such. Nadja seemed to identify with the students and enjoyed their attention. Then on to Vienna and German idealist theory, the byways of interpretation, and all that. The 'palast' was only two blocks from the Staatsoper with its many temptations. The famed pianist, Paul Badura-Skoda, could be heard practicing below while Charles held the students not quite spellbound on Kant and Hegel. Yes, they have a cat. And so many books (6000) that they feel anchored to Sutter Avenue. Charles plays in the Peninsula Symphonic Band and urges you to attend the quarterly free concerts at Spangenberg. They are a bit feeble but still managing: Margot with titanium enhanced hips, Charles with a couple of pegs in his spine. They are much beholden to the Stanford benefits office.